With just a few minutes remaining before midnight on Deadline Day for registration of teams for the 2019 league season of the British Baseball Federation, Herts Baseball Club submitted five team entries, adding two new Herts teams to the three which played in the BBF leagues last season. The Herts Londoners were unveiled three weeks ago, so their league entry was expected. The question which everyone was asking was which league the Londoners would play in. The club has now confirmed that they will play in the Triple-A League – the second league tier of British baseball. A Triple-A team has been the missing piece in the Herts team lineup. There hasn’t been a Herts Triple-A team since 2015 and the last time they won the Triple-A National title was in 2008 (pictured right). The club now has a team in all four league tiers which gives them the opportunity to offer baseball to players of all levels from beginners to players of the highest calibre. The Triple-A League is seen as the stepping stone for players aspiring to play in the National Baseball League (NBL). Triple-A teams are monitored closely by the Great Britain National Team coaching staff as they feature many players who are bidding for a place in the various GB National Teams. It is a very competitive league so the Londoners will probably be seen as the underdogs in 2019, but with two months remaining until Opening Day and new players registering to play for Herts every week, they may surprise their opponents. We thought that this would be the only news today but, without any advance notice, Herts also confirmed that they will be entering a fifth team, reviving the Herts Eagles who played in the Triple-A and Single-A Leagues in the past. Like the Londoners, the Eagles will also be based at the club’s new Basing Hill Ballpark in North West London. This season they will play in the Single-A League which is the fourth tier of the British baseball league system. “Since player registration commenced for the 2019 season we have seen players of all levels registering to play at our new ballpark in NW London and having two teams there in Triple-A and Single-A enables us to offer the right baseball experience to players of all levels” said a club spokesperson. 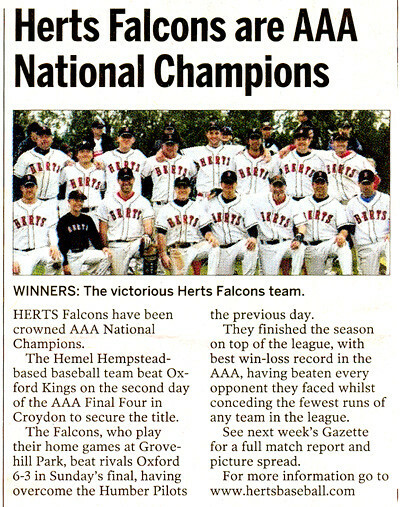 Herts Baseball Club has had five senior league teams only once in its history. That was back in 2013. The difference this time around is that three of the teams will play their home games in Hemel Hempstead and two in NW London. We understand these decisions were made by the club late into the night at a conference call which was originally scheduled to last only 45 minutes, but ended up being a tense discussion which took nearly three hours to come to a conclusion. They had to consider a vast number of factors such as roster size and competitiveness at the two ballparks, how many more players are likely to join the club between now and Opening Day, and how many more will do so throughout the six months of the baseball season. Then there is the MLB London Series factor. The club is already seeing the positive effects of this, and it is likely to be felt even more as we approach the Boston Red Sox and New York Yankees games at the London Stadium on 29 and 30 June. Deadline Day for team entries has now passed, but Herts has left sufficient room in its five team rosters to be able to welcome new players throughout the year. 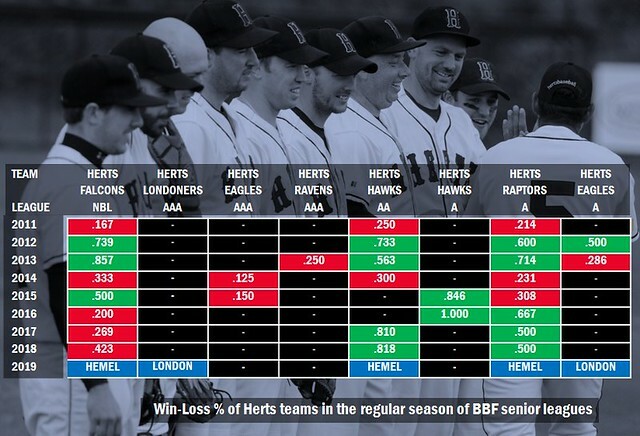 We now wait to see what surprises the BBF will have for us, what the four league lineups will look like in 2019, and what opponents will stand in the way of the five Herts teams. Adult and youth players, from beginners to advanced players, are now registering for the 2019 baseball season. For more details about how to join any of the Herts adult and youth baseball and softball teams in Hemel Hempstead and in NW London or to try baseball at an upcoming open session, contact Herts Baseball Club. Previous Topic: He is back!